When you attend a tradeshow such as the HD Expo there is always an Exhibit Hall chock full of pretty booths that proudly display the wares of the exhibitors. The room is full of light and energy and is an exciting place to be. But for most exhibitors, such as ourselves, there is a tremendous amount of work that goes into organizing and setting up the booth before the convention participants enter. Fortunately for us, the HD Expo is “local” (Las Vegas), allowing us to rent a van and make the relatively short 5 hour trip with our display in tow. As we are a small custom hardware company with a somewhat high end niche product we are very “hands on” in the design, set up and time spent in the booth during the Expo. Larger companies will often invest considerable sums of money to create very slick and elaborate booths. By comparison, our focus is on showing key pieces and debuting new pieces; and while our booth is certainly pleasing, the emphasis is squarely on the product. Martin Pierce is on hand, making it possible for hospitality designers and architects to meet him and personally discuss their projects to find out the feasibility of customizing our designs to meet their needs. So you will meet both Martin and Anne Pierce in booth #4659 this year (as in prior years). As I mentioned earlier, a tremendous amount of work and stress is involved in creating a pleasing booth. Choosing the right combination of both signature and new pieces to squeeze into a 20’x10′ booth is challenging. It is for this reason that we attend just one show a year; so we search for a show that focuses heavily on the professional design community who are, after all, our patrons and those who specify our work to their clients. We like to debut new pieces at the show but there is a process in deciding what pieces are ready for their debut. There are several stages involved in launching a new piece including several prototypes necessary to get it “just right”. Add to this the marketing of the new pieces which begins with professional photographs, a digital CD (handed out at the show) along with a newly designed CD cover. And, of course, the website must be updated with these new products before the show. Finally, we will prepare a press release that will get digitally distributed through the shows website. Whew…I am tired just writing it all down. In our next post we will share a checklist that keeps us organized before, during and after the show. 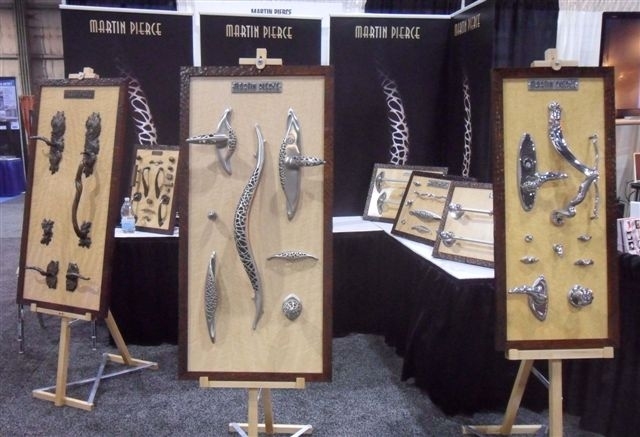 If you would like to view our collection of custom architectural hardware, please visit our site at http://www.martinpierce.com. And be sure and stop by our booth #4659 at the 2014 HD Expo next month. This entry was posted in architectural hardware and tagged custom hardware, hardware display booth, trade show organization, trade shows. Bookmark the permalink.